For my giveaway of The Appliqué Book, I asked entrants to share an aspect of appliqué they were interested in learning about. 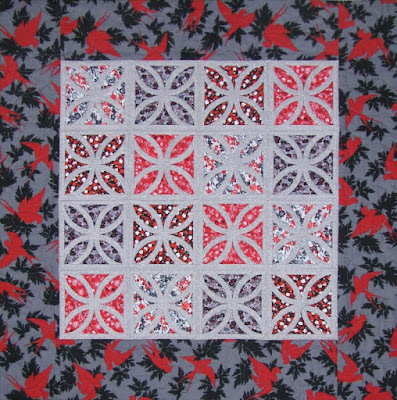 Several people mentioned bias appliqué, which has its own section in the book. We’ll get to the giveaway in a second, but I thought I’d show some of my projects using bias-tape appliqué to give you some ideas about how this versatile technique can be used. Cordova and my two Grey Gardens quilts use bias appliqué to make geometric patterns inspired by lowly concrete blocks. 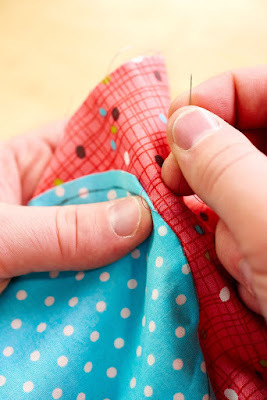 Deceptively easy to sew! 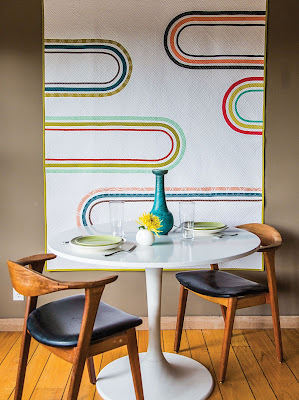 For these table linens, I played with intertwining the bias strips to make free-form shapes. 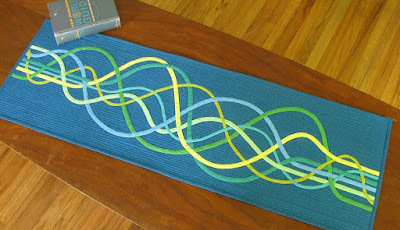 Then I went totally crazy with the weaving for this runner I designed for a webinar a while ago. If you missed the webinar during the Sewing Party, you can now download it from my website to learn how to design and construct your own woven bias runner. 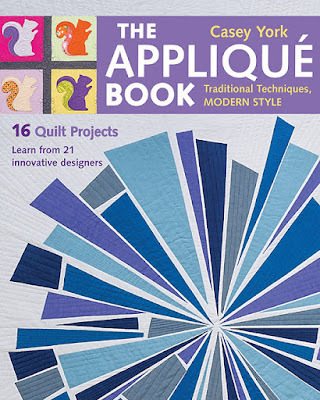 The winner of a free copy of The Appliqué Book is commenter number 28, Jodi - usairdoll, who was interested in learning about reverse appliqué (as many of you were). Congratulations Jodi—I’ll be in touch shortly. Thanks to all who entered! One last note...now through Monday, March 28, Craftsy is offering 50% off all their classes! 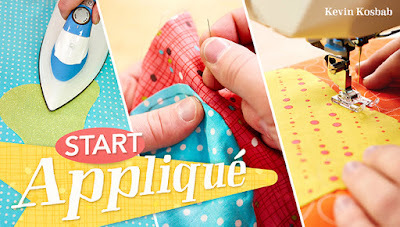 If you’re getting your feet wet with appliqué, you’ll learn to find the right technique for you in my class, Start Appliqué, on sale for $19.99. Or use my affiliate link to take your pick from a myriad of other classes in quilting, sewing, embroidery, and more! I’ve been looking forward to The Appliqué Book for a long time, ever since author Casey York and I chatted all things appliqué over lunch at a quilt show we taught at a couple years ago. I’m honored to be included among the appliqué quilters profiled in the book, and delighted to be one of today’s stops on the blog tour! 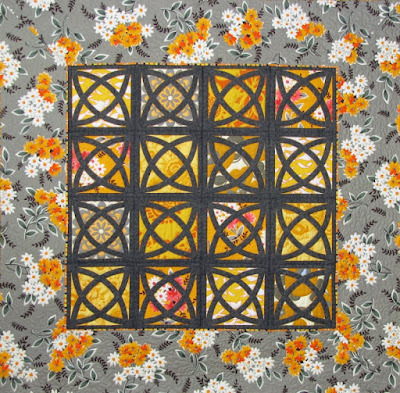 Casey’s previous book, Modern Appliqué Illusions, thoughtfully explores unconventional ways to use appliqué to build a sense of perspective into quilts. What I love about The Appliqué Book is that it shows there really is no such thing as “conventional” appliqué: instead, there’s an infinite variety of approaches. Rather than being forced into some one-size-fits all standard, the projects in this book show the individual methods used by the designer, making each project a kind of case study of what can be done with a particular working style. The diversity of technique in appliqué is rivaled only by its plethora of aesthetic possibilities, and the designers featured each bring a unique eye to the book. I love the the free-form stitching and the mix of wool felt and linen in Betz White’s coasters, and equally love the strikingly geometric Sweet Pickles quilt by Latifah Saafir (those bias strips are fussy cut!). It’s especially impressive that there’s extensive instruction to go with the wide range of projects and techniques. I always encourage students in person and online and readers of my own appliqué book to explore lots of different ways of doing things, and The Appliqué Book offers just that. If you’re looking for appliqué inspiration, order a copy of the book now (you can even get a signed copy from Casey). Or try your luck at winning one! To enter the giveaway for a copy of the book from C&T Publishing (hard copy to U.S. winners; e-book for others), leave a comment on this post telling an aspect of appliqué you’re interested in learning more about. Entries close at midnight, March 25 (Pacific Time); I’ll announce the randomly chosen winner on March 26. Make sure your comment or profile has your e-mail address! Giveaway has ended. Congratulations to winner Jodi - usairdoll! So what is Craftsy anyway? Sometimes at my quilt guild we rattle off program names like block of the month, fat quarter drawings, and stash for cash work, forgetting that new members may not know how our programs work, or even what a fat quarter is. I’ve been talking about Craftsy a lot, and while you may be familiar with it if you read lots of craft blogs, you may not. 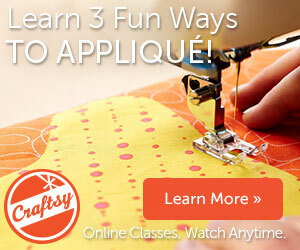 Craftsy is essentially an online, video-oriented learning platform for all things creative. One of the big differences between a TV show or DVD is that there’s an interactive component to the classes: you can ask the instructor questions (and benefit from other students’ previous questions and the answers), share pictures of your work, and get inspired by other students’ work. Committing to answering students questions is part of what we instructors agree to when we sign on with Craftsy, so you won’t be asking into the wind. I resisted taking online classes like this for a long time, since I tend to be a pretty conventional book learner. In high school, the AP classes I did best in were the ones with really solid textbooks, not ones where we watched films or did participatory group projects. So for learning quilting and craft techniques, my first port of call has usually been a book. But there are certain things that just don’t lend themselves that well to written description or static illustration. When writing my appliqué book, I found it really difficult to describe how do needle-turn appliqué. I hope I did a decent job, but as I found when teaching in person, it’s much easier to show students how to hold the needle, how to manipulate the fabric, and how to place their stitches than it is to write it out. And in my Craftsy class, you get that visual, in-person guidance with the added benefit of close-up camera shots and the ability to back up and rewatch until you really understand something. Bullion knots occurred to me recently as a good way to make feet for my pigeon quilts. I’d seen the stitch demonstrated before but never attempted it myself. Now that I was picking up needle and thread, I needed to see it again. I could have sifted through dozens of YouTube videos of varying quality, but I knew Craftsy would give me quality, high-definition instruction from the best-known bullion knotter I can think of, Sue Spargo. So I enrolled in her class, watched the bullion knot section several times, and set to stitching. My first few knots weren’t quite right, so I repeated the segment again and immediately knew what I’d been doing wrong. Seeing the stitches actually forming was just what even an old-school book learner like me needed. One of Sue’s class samplers—bullion knots are only the beginning! Craftsy wants their students to be happy, and they want their instructors to be happy too. I’ve worked with several craft-oriented media production companies, and Craftsy stands out as one that goes out of their way to make the behind-the-scenes process smooth, smart, and fun for everybody involved. If we’re enthusiastic about our experience, it’s a lot easier to make students enthusiastic about the classes they take! The company also recognizes that we instructors tend to be running very small businesses around the creative pursuits we love, so they help us out by giving us the chance to share in the profits of our own classes and any others we promote. So if you enroll through one of my affiliate links to, say, Sue Spargo’s embroidery class, you’ll get a discount and I’ll get a little money too. And that helps me be able to create more things to share with you! To spread the joy even further and celebrate National Craft Month, Craftsy’s currently offering the chance for one student to win $1,000 for the craft-based charity of the winner’s choice! 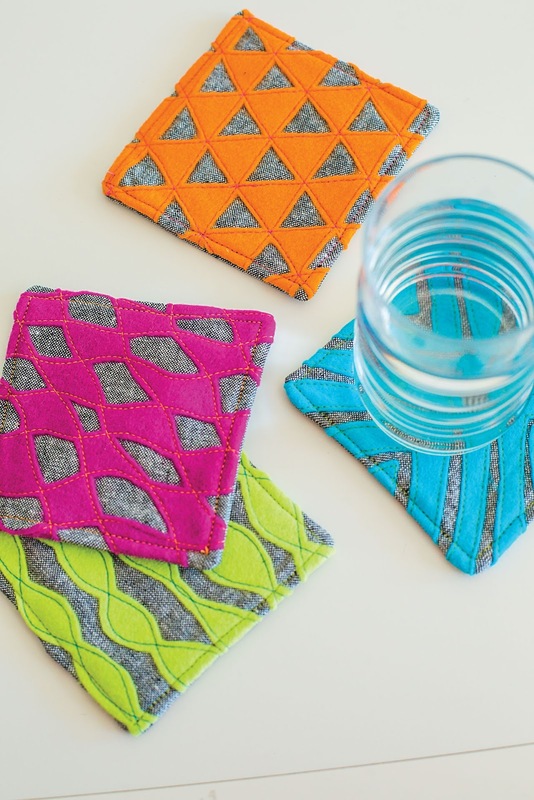 Depending on the number of new students who sign up, the donation will be doubled, so if you’ve never taken a Craftsy class, this is a great time to try it out! Since Craftsy offers full refunds if you aren’t happy, you have nothing to lose, and spectacular new techniques to gain for your quilting and crafting. The National Craft Month offer only runs until March 13, so click here to try a class today! A visitor to my website recently asked me to recommend a good beginner sewing machine, and she specifically was interested in appliqué. In case anybody else has similar questions, I thought I’d share some of my experience with machines here. My first advice would be to talk with an independent dealer (preferably one who stocks multiple brands), who will help you figure out the right machine for your plans and budget. I use a Janome these days, and I’ve heard good things about their entry-level machines, but there are plenty of other good makes out there. To some extent, you get what you pay for: the sub-$100 models in discount stores probably aren’t going to get you very far, though you needn’t start with one of the $10,000 numbers that has more in common with R2-D2 than with Grandma’s Singer. And keep in mind that you never know what you might find secondhand, though in my experience the best deals come when you aren’t looking. White 2037: an all-mechanical model with a good range of functions. The Mother bought it for me with the idea I’d sew some curtains and pillows, for which it was well suited. Had we had any idea I’d get into quilting, she might have picked a different machine, but the White did have a quarter-inch piecing foot standard, so it was easy for me to start piecing without extra accessories. I pushed the limits of the machine with appliqué, for which it was perfectly capable but lacking the bells and whistles to make things easier (see below). Pfaff 1171: I scored an incredible deal at a thrift store on this machine from 1986. At the time, sewing and quilting had become the better part of my job, so this workhorse machine was a godsend. The built-in dual feed was a major upgrade over a walking foot, and the needle-down function was a big help with appliqué. This machine hardly ever met a seam it couldn’t sew, and at the risk of sounding like a grumpy old man, they just don’t build them like that anymore. Sadly, a dodgy repair fried its motherboard. Janome 8900: this, my current machine, was the first one I carefully chose knowing the kind of sewing I do. I wanted to retain the Pfaff’s the power and reliability (reliable until it wasn’t, that is! ), which led the dealer to recommend this machine. I spent several hours in the showroom with a very patient and knowledgeable dealer, who really listened to what I needed from the machine—my top advice is to find a dealer who wants you to be happy with your machine, not just a dealer who wants to sell you something. You’ll be able to tell the difference. While I’d never suggest choosing a machine because of how many decorative stitches it has, I was looking for an updated stitch selection, including the blanket stitch and appliqué blind hem that were missing from my Pfaff. This Janome came with a dual feed that was arguably more flexible than the Pfaff’s, it had a nice wide throat for quilting (most of which I do myself), and it feels cosmically in tune with me when free-motion quilting. I used each of these machines for raw-edge and prepared-edge machine appliqué techniques. 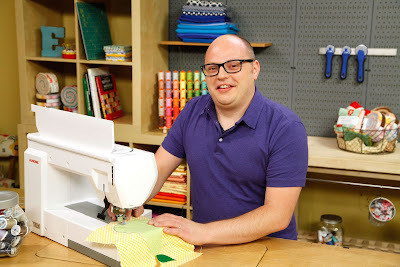 All the projects in my book were sewn on the Pfaff, and the Janome is what I now use at home and on camera in my Craftsy class. 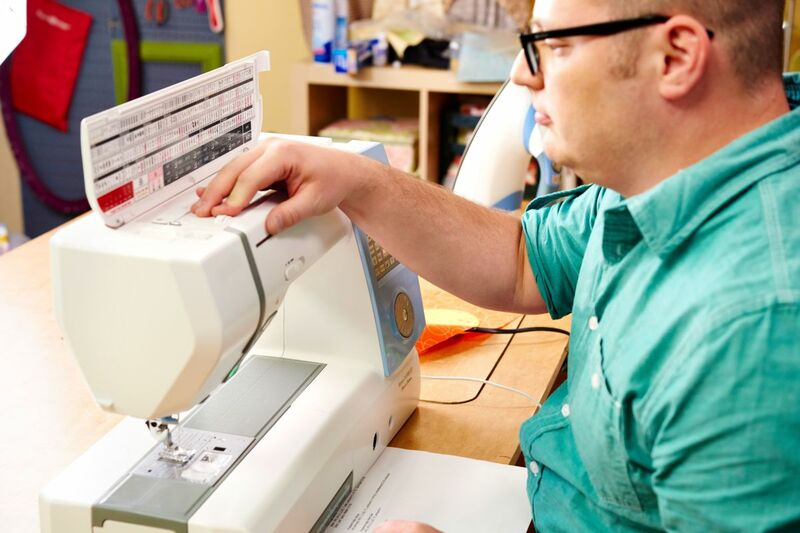 An adjustable zigzag is really the bare minimum you need to do all kinds of machine appliqué. 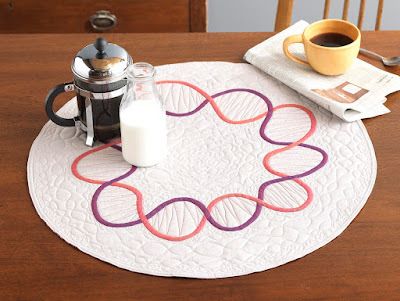 For a list of features that can make appliqué easier, take a look at this free excerpt from my book, The Quilter’s Appliqué Workshop. 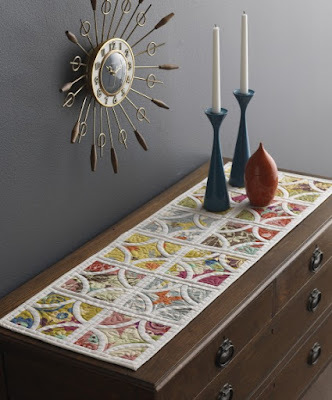 What machine features do you appreciate for appliqué? Thanksgiving isn’t a very big deal round here, mainly because our family is on the other side of the country. But the Other and I are always happy to have some time off from regularly scheduled programming, and though working for myself means never being caught up—there’s always some quilt I should be sewing, or a pattern I should be writing—I like to take advantage of the long weekends to indulge in my playlist. 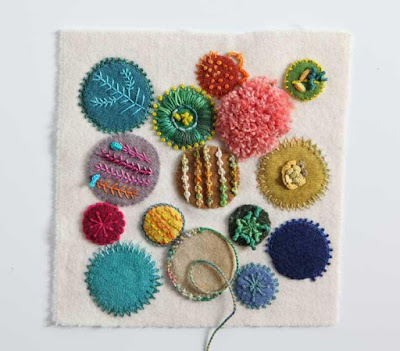 Not a music playlist, but a crafting or needlework playlist. It’s easy to get caught up with whatever sewing I need to do for my work commitments, which takes away from the joy of creative exploration just for the fun of it. So I try not to let myself feel guilty when I work on projects that are just for play, and I always have an active “playlist” on the go of things I can pick up to work on when I just feel like sewing. Or embroidering. Or weaving. Or whatever—just creating. I add to this freeform shisha-embroidery sampler whenever the mood strikes, which is usually when I have new threads to try out. It lets me play with fibers and stitches without worrying that I might “ruin” something that has to get photographed for publication. But these experiments can and do lead to ideas that get used down the road, so it’s actually a useful exercise. Oh, and if you couldn’t tell, those are the tops of needle threaders instead of actual shisha mirrors. I’m fascinated by the different obscure faces on them but I don’t very often use a threader, so they might as well get stitched down! I found this 1973 bargello needlepoint kit several years ago when visiting my parents. Embroidered with super-chunky yarn, it was already partially finished, so it was a relatively simple job to fill in the rest of the pattern. I just worked on it when I didn’t have appliqué or other handwork to do while watching TV. Maybe someday I’ll finish it into a pillow; maybe not. There are no obligations on the playlist! I’ve mentioned my fondness for pigeons before. Correct me if I’m wrong, but I don’t think there’s a big market for pigeon quilt patterns, so this appliquéd pigeon was just for me and just for fun. Before starting him, I’d sewn a quilt of yarn-dyed stripes for Stitch, and though the quilt was simple, I’d loved sewing it because it was such fun to fondle all the woven fabrics. I wanted more, so I started amassing shot cottons and shirtings in enough shades of grey to make a pigeon. But he only suggested more pigeons: scruffy pigeons. Fat pigeons. Pigeons wearing top hats. Pigeons made of silk. A whole series of pigeons. Use your playlist to explore a new craft—for me, weaving. The Other’s keen eye for thrift-store bargains has netted me a range of secondhand looms, so my playlist also includes tinkering with weaving. 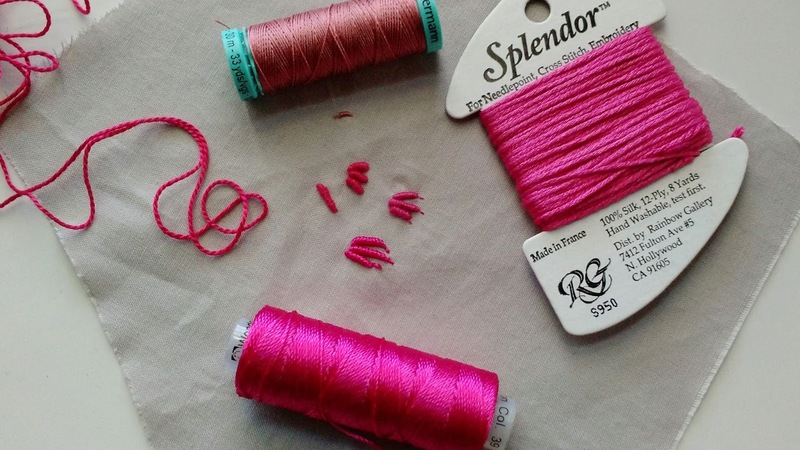 Sewing, quilting, and embroidering share a lot of tools and methods, but weaving’s a whole other thing, which I have no training in—but learning about it really engages the creative juices. 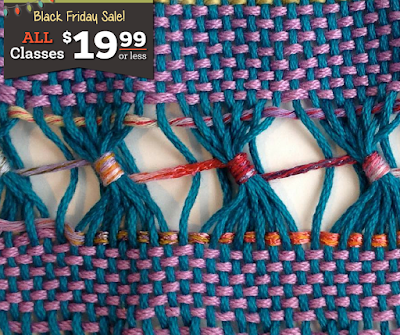 So I’m going to take advantage of this weekend’s Black Friday sales to stock up on some weaving instruction. 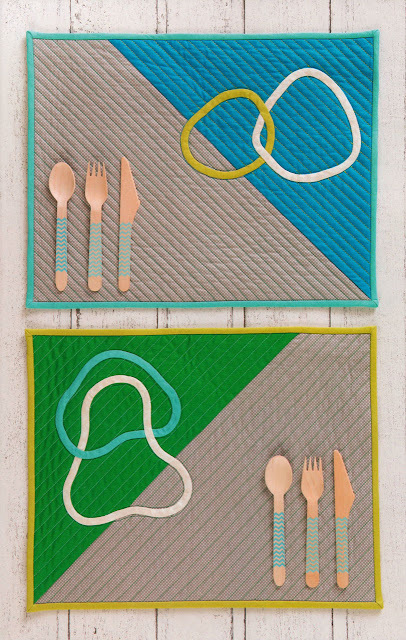 Pickup Stick & Finger Control Techniques looks intriguing on Craftsy, where all classes (including quilting!) are on sale for $19.99 and under. And Interweave’s $5.99 ebooks and videos sounds like the perfect opportunity to indulge my curiosity in inkle weaving . I may be a quilter by trade, but one point of the playlist to encourage such indulgences—you never know where they might lead. So what’s on your playlist?